I was drawn to the sculpture for its design but also because I recognized it. I thought I saw this in Milan, what was it doing next to a Medical School building on the University of Chicago campus? Turns out there are five other “Grande Discos” throughout the world each made within the same general time frame and varying slightly in design. 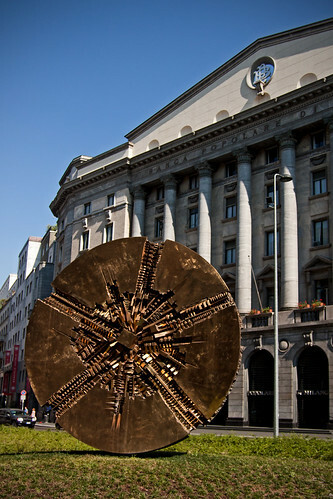 Located in urban, commercial and green spaces, the pieces are enhanced by the environments they have been placed into. See what you think of these outdoor installations. Personally, I think the Grande Disco does the best in the two extreme environments: the rolling green sculpture park and in the shadow of North Carolina skyscrapers. 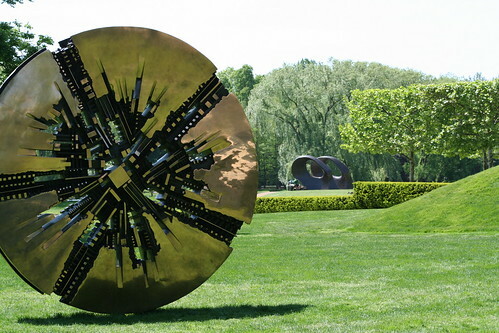 What’s not to love about a shimmering disc and its circuitry-like innards in a public park? I like the contrast between the vast and organic versus the engineered look of the disk. (Think opening scene of 2001: A Space Odyssey.) 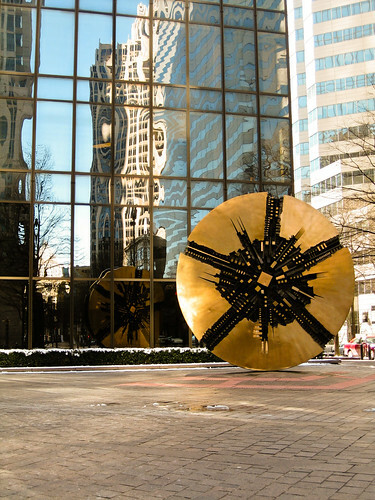 Conversely, just as idealized human figures match the refined order of a Renaissance palace, the disk matches the cool modern commercialism of the business center in NC. Skyscrapers and minimalist office building resonate progress and profits as executed by the non-human corporation. In this context then, the disk is opening to reveal some innovative technology without the obvious hand of a human creator. To appreciate a copy of Grande Disco, you really do need to get up close and look through the cracks of diverging metal and see the veins of emerging cubes. It’s essential then not to put it on a pedestal and certainly not to construct a moat around it. 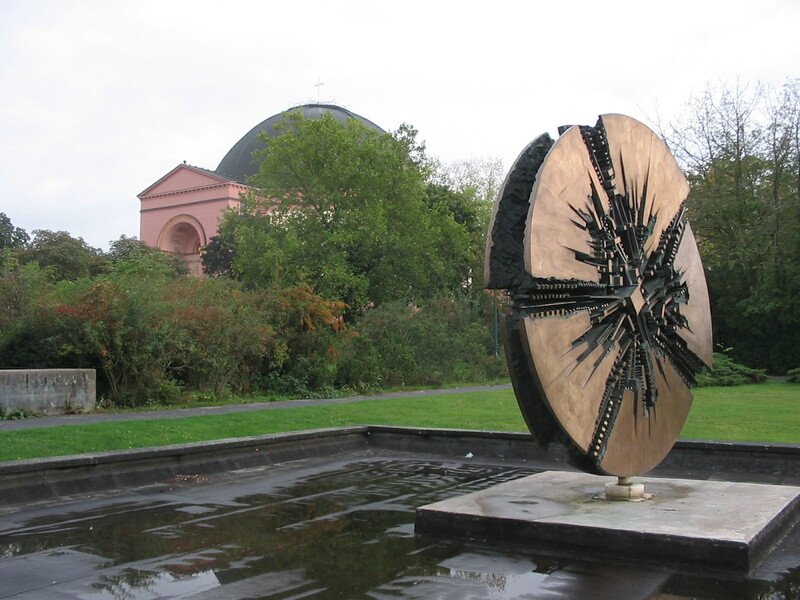 The Darmstadt and Theatro Strehler disks follow the old philosophy of public art installation – convey importance through esteemed placement away from the viewer. This may work for triumphant equestrian statues but not for modern pieces whose foreignness is their intrinsic beauty. Lastly, while Chicago and Piazza Mede do let you get close to the disk, the placement is still not perfect. There is not enough room on that U of C patio for such a big, interesting piece and there are other things that would look better with the surrounding architecture in Piazza Mede. As you can see, a little bit of spatial context can make a big difference. I had no idea there was more than one of these discs. I used to work at Pepsico, Purchase, NY and saw that disc daily and still take walks through the beautiful gardens there. When my son moved to Charlotte, NC he showed us another of these discs. Just beautiful! I’m glad you’ve enjoyed two of the disks. They really are incredible up close. 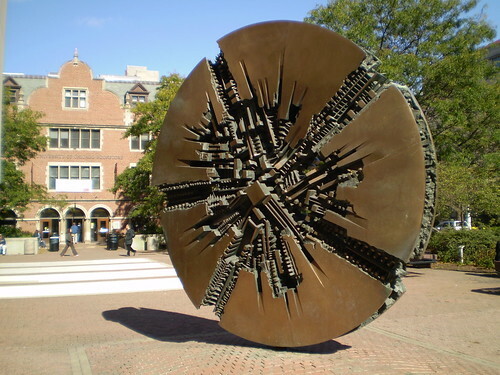 The one at the University of Chicago used to spin – you could push it and it would rotate. But then they fixed it in place. Really? That’s amazing, I’d love to see one rotate. Yes, I forgot to mentioned, the one in Caracas, Vzla used to rotate that is why we used to have fun when were kids. Thanks for clarifying. The temporary move luckily gave us another context in which to see the sculpture. I actually have a story to tell you, I’m from Caracas, Venezuela currently leaving in the US, back in the 80s my mother used to work at this building called Torres Las Mercedes, at the entrance of this building there was what I now believe to be a down scale replica of this Grande Disco, I say a replica because back then I was 10 to 12 years old and I used to play around this Grande Disco while I was waiting for my mother to get off from work, and as I stand next to it I could reach half way up of the Disco. Years went by, I left my country, and I’m now living in the US for more than 20 years. Yesterday, I was in Charlotte, NC and I came across this Grande Disc, almost 30 years later. Now, reading the history of this Grande Disco come to realize how art can be part of our life without you knowing it. So for the record, yes there may be 5 official Grande Disco, but in fact there is 5 and a half since the one I used to play around with was about half the size of the one I saw in Charlotte, NC. fwiw, last time I check the one in Darmstadt still rotates. There seems to be some confusion with exactly how many Grande Disco there are. The 6 in this article are the only ones actually named “Grande Disco”. Pomodoro has done several other disc series which go by different names. He has also designed several series of spheres, cubes, columns and cones. 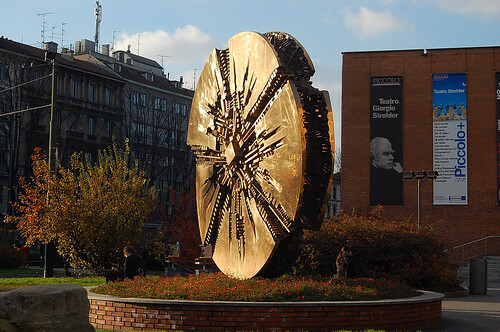 Absolutely, Pomodoro has some other interesting but similar sculpture series. Thanks!